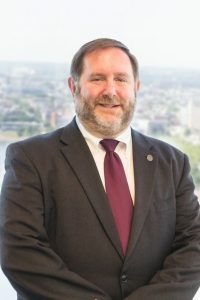 Offit Kurman Delaware attorney, G. Kevin Fasic, introduces the speaker for the Delaware State Chamber’s 20th Annual Superstars in Business lunch on November 7, 2018. Mr. Fasic was chair of the event as the immediate past co-chair of the Chamber’s Small Business Alliance Board of Managers. The annual Superstars awards program recognizes top small businesses in three categories (1-25 employees, 26-74 employees, 75-150 employees), as well as a separate non-profit category. 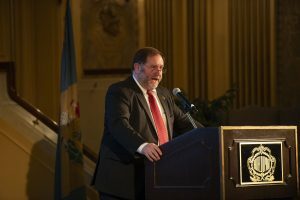 The event also awards the prestigious Gilman Bowl to an individual who demonstrates a commitment to the growth and vitality of Delaware’s small business community.